What is the best protective case for GPS systems in 2019? An RV GPS is an important investment. Because of that, you need to secure optimal protection for it. For protection purposes, manufacturers have designed professional cases that will keep your RV GPS safe. Many things can happen to your brand new GPS: you can place it in an unsafe spot in your car, a hard impact can damage it, you can drop it from your hands if you’re not paying attention, you can leave it out in the pouring rain etc. Especially nowadays, when GPSs are fitted with large, prone to scratching and cracking, LCD screens, you may want to think about acquiring a protective case all the more, as it will help you avoid all unhappy accidents. Most certainly, not all models available on the market are able to provide your GPS with the necessary protection, but some models, built with high-quality materials will ensure that your GPS stays in one piece. This is a model that provides versatility, as it can accommodate a number of various GPS models. Since it has a generous capacity, you can fit in a giant-sized navigation device and additional items as well, such as the mount and power cable. Your GPS essentials are protected against damage and impact thanks to the soft interior of the case. In addition, this product features adjustable fillers that can hold smaller navigation units also. If you fill the case to capacity, you might not be able to pull the zipper shut and may need to put some force in order to achieve that. 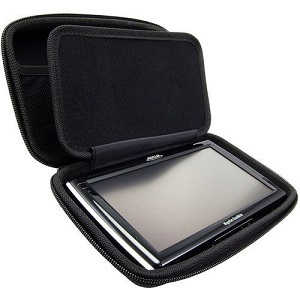 Fit your GPS and accessories in this large, high-quality case. 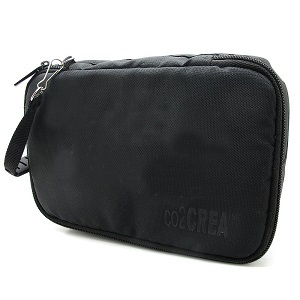 This product does not look like a regular carrying case for your GPS since it is as elegant as a fashion pouch. Made from tough and waterproof neoprene, this item was designed to ensure the complete protection of its contents, and it is very durable and easy to clean as well. The smooth, protective lining of the interior will protect the GPS unit from scratches and other damages. You also get an outside pocket to accommodate other small items. As it only provides space for a very tight fit, the case would be appreciated more if it offered some extra room for the power cord. A durable and elegant carrying case for your GPS unit and accessories. Not only is it spacious enough for you to fit your GPS unit and accessories but this case is also equipped with a handle which makes carrying it around easy and comfortable. It has two zippered pockets, one for the GPS and the other for small items you might want to keep secure and protected. The included strap holds your navigation unit in place and the strong materials protect your belongings. This case can accommodate many types of GPS units. The item will not fit an irregularly shaped windshield suction cup attachment but will accommodate other types with no issues. 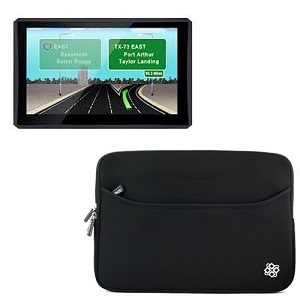 Keep your navigations system and accessories safe with this item. When you spend a lot of money on a reliable GPS unit, you should not become cheap when it comes to its protection and invest a little more to ensure it does not get broken or scratched. A good navigation system can serve you well and always keep you in the right direction until you drop it by mistake. A good case for your GPS system can ensure an extended life for the electronic device. Still, there are so many options on the market and selecting the right model can become quite a hassle. This brief guide is meant to highlight some of the key features a good product in this line needs to have. First of all, a protective case that cannot fit your GPS unit is actually pointless. Before starting to look for such a product, you need to know the dimensions of the device. This is the first thing you should also check when you find a model you might like. After you made sure you can fit your navigation system in the case, you might also want it to accommodate the power cord or other accessories. Therefore, it should be large enough to hold all of your items safely. Since we are talking about a protective case, the materials used for the GPS case must be strong enough to keep the unit safe from scratches or damages. It is even better if the cover is waterproof. It is a known fact that electronic devices can get damaged if water reaches them. With such a feature, your navigation system and its accessories will be kept safe regardless of the weather conditions you might encounter. Apart from having a strong construction and quality materials, we recommend going for a model that holds the GPS unit in place, with a strap, for example. That way, even if the device is smaller than the case, it will still be well protected. If you intend to carry other accessories, your case should have at least two pockets — the zippered ones are the most useful. Having the GPS device and other accessories in one pocket can lead to scratching the display. This guide should give you an idea about what to look for when you want to purchase a protective case for your GPS device in order to keep it secure. If you need a protection case with large dimensions, where you can fit not only your GPS, but also additional accessories, such as batteries, USB cables and adaptors, you can acquire this product as it surely won’t let you down. This case won’t only provide a safe environment for your GPS, but it also comes with multiple compartments to accommodate accessories or even other devices you want to keep protected but don’t have a safe space for. Moreover, the case is padded with an extra soft material to ensure that the screen of your GPS won’t be scratched while on the move or if you accidentally drop it. This carry case can accommodate a number of different GPS models to provide versatility. They include the Garmin RV 760LMT 7″ GPS, Garmin Nuvi 2797LMT, and the Garmin Nuvi 2757LM. If you have a giant-sized GPS, this is the protective case to get, as it has a very generous capacity to hold your navigation device in addition to other items as well. The case accommodates your other essentials for your GPS including the power cable and mount, so you won’t need to find another case or suffer from getting them misplaced. The soft interior ensures that your GPS essentials are kept protected from impact and damage, giving you peace of mind. The case is equipped with fillers that can be adjusted for smaller units and there are sections to handle other items safely. Once the case is filled to capacity, there is a likelihood that the zipper will be hard to pull shut and may need some force to accomplish that. This is another high-quality product you can find available for sale. It is built with durable neoprene, a material that is known for its waterproof qualities that will ensure your GPS stays protected even if you drop it in water. Additionally, the case is also easy to clean due to its fabric. As it is a product offering plenty of space, this case can fit your GPS and keep it protected, but it is not too big for you not to be able to fit it in a bigger bag when you go travelling. In addition, the case is fitted with an exterior pocket, where you can place other items, such as the mounting system or cables. This is a smart-looking GPS carry case that seems to be as elegant as a fashion pouch since it doesn’t look like a carry case for a GPS device at all. The carry case accommodates the following models: 9165T-LM RV; Garmin dezl 760LMT; Garmin 2797LMT; 1700-LM; Commercial 9270T-LM; and the Magellan RoadMate 9250T-LMB, in addition to other 7-inch GPS devices. This exceptional carry case is made durable and easy to clean and is constructed of tough and waterproof neoprene to ensure the complete protection of the contents. The contents are protected from scratches and other damage thanks to the smooth, protective lining of the interior. The pocket on the outside accommodates other items such as your credit card, driver’s license, emergency cash, and other travel essentials. Although the case might have room to accommodate the power cord of your GPS device, it may provide just about enough of it for a really tight fit. If you are looking for a spacious travel case, able to deposit not only your GPS and its accessories, but also other items, this is the product you need. The case is also fitted with a handle, so that you can carry it in your hand easily. The product has 2 separate zippered pockets, one designed to shelter your GPS and the other for delicate items you may want to keep protected. It is built with strong materials and resistant zippers. Not only this case is lined with soft padding, but it also includes a strong strap to keep the GPS in place in its compartment. Due to its increased dimensions, this case can fit a large variety of GPS devices. This carry case is suitable for a variety of GPS devices that include the Magellan Roadmate RV9490, RV9365T, RV9165T, RV9145T, RV9170T-LMB LM, the VIA 1605TM, the TomTom VIA 1605TM,the Start 60, GO 6000, and GO600, the Garmin Nuvi 7-inch 2797LMT,2757LM, 2798LMT, and 2789LMT, the 6-Inch 66LMT, 2639LMT, 2689LMT, and 65LM nuvicam. This carry case provides storage and transport options for all the other accessories that go with your GPS device including the vent or suction mount, vehicle charger, and other small items. The canvas-like material does not soak up moisture from the outside, so the contents of the case are protected from damage due to water exposure. The large zipper provides a secure means of closure while facilitating the process with smooth travel around the case. The convenient short handle enables you to hang the case or carry it in your hand during travel or to the vehicle. This carry case will not handle an irregularly shaped windshield suction cup attachment, but it has room for standard ones.